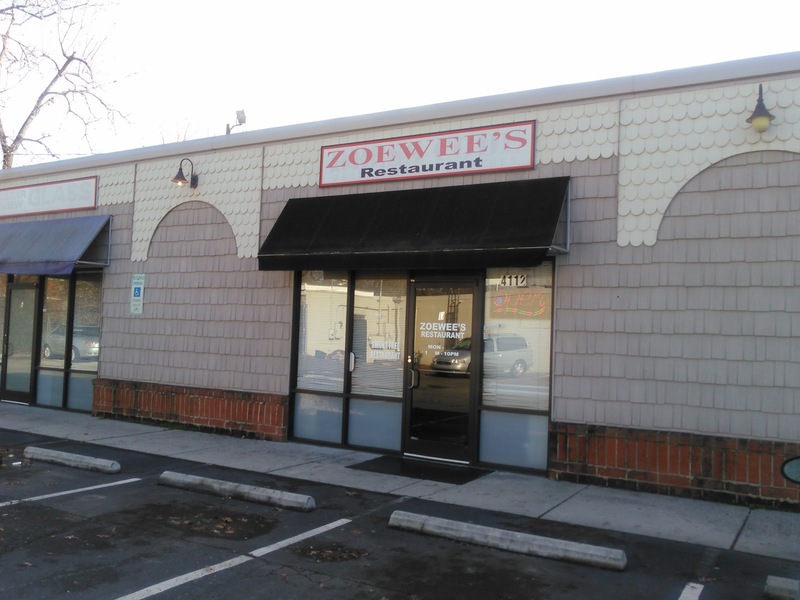 Zoewee's Restaurant - African Spice is Nice! The other day on a ride back from 1801 North Tryon Street (spent looking at what various groups/entrepreneurs have done with their spaces), Melanie Dunston of K & M Catering and FB Group, Charlotte Wellness and Events) asked me had I been to Zoewee's. My usual answer of "no, who are they?" was given, at which she promptly began to wax long about the wonderful food, the great people and the homespun hospitality of this hidden gem. So before I could pass the strip mall it's located in (believe me, you can pass it! ), we pulled into a rather, bumpy parking lot (drive slow and show your shocks some love!) at 4112 North Tryon Street, Charlotte, NC 28206. All the way in the back sat Zoewee's African Restaurant, rather unassuming and definitely not hinting of the great dishes inside. Unfortunately, when we knocked on the door, they were closed. And, even though we wandered over to get some Hot Ginger Ale and other delicacies at a nearby African Food Market (another blog post coming up! 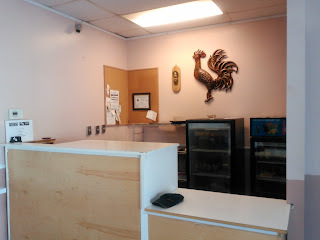 ), I was hungry and wanted to sample the food Melanie kept talking about more and more. 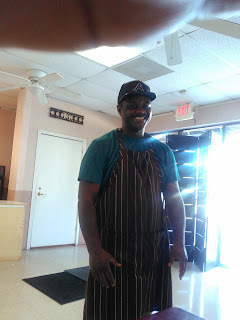 So, back we went and this time, we were greeted by Lewis, the chef, who informed us that even though something smelling really good was wafting from the kitchen, he was not ready to open and that many of the dishes were not prepared yet. We both promised that we would eat whatever he brought out. I tell you, it was a total treat! 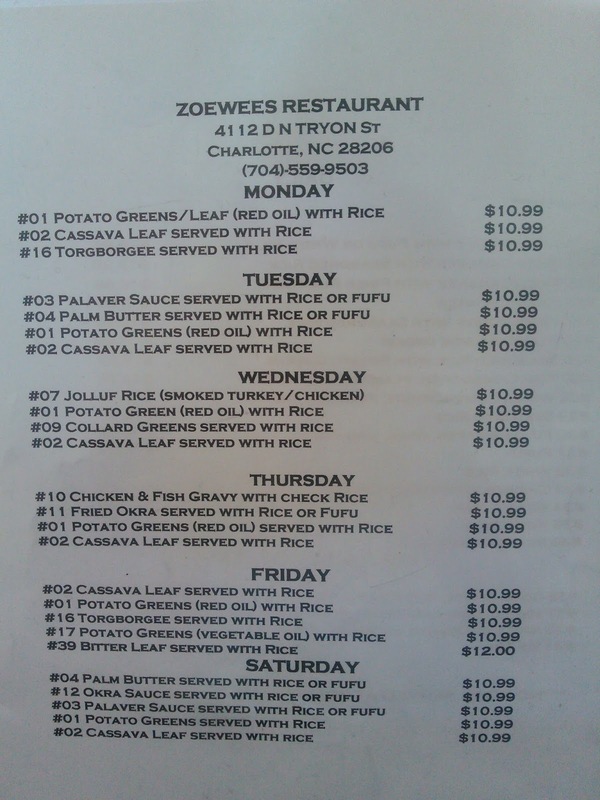 Zoewee's, at this location for six years, is definitely a word of mouth and traditional Liberian food find. As for accessibility, there is a low threshold to get into the building, though no automatic doors. 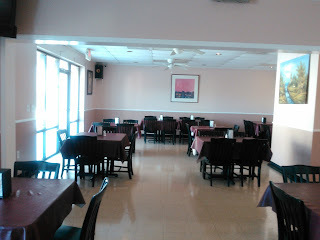 It is simple tables and chairs with plenty of room to maneuver or rearrange seating, if needed. Large windows with a light colored floor made the space well-lit for me. The sidewalk outside is almost flush with the parking lot, so maneuvering a wheelchair or a scooter should not be an issue. And, while I didn't notice any designated accessible parking in front of the restaurant, the lot was quite empty, with designated spaces in other parts. I do suggest a run through and a call ahead, especially with the lack of an automatic door, but everyone is friendly and eager to please. Melanie loves to chatter about Charlotte's hidden spots and this was definitely one. 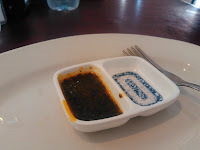 Run by Mr. Ernest, a quiet, polite but knowledgeable man, we were served by the chef, Louis, who first brought us a sample of the Palava Sauce, a spicy, but not too hot beef sauce. It had a musky earthiness that instantly warmed me. 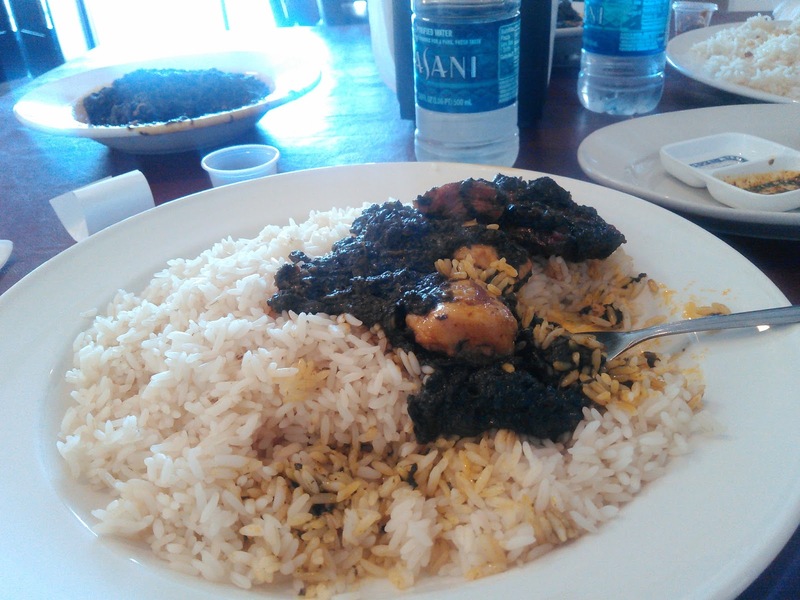 But, I wanted the only entree already finished, which turned out to be Potato Leaf Greens with Chicken and Turkey over White Rice. What an explosion of African spices, peppers and just plain flavor! 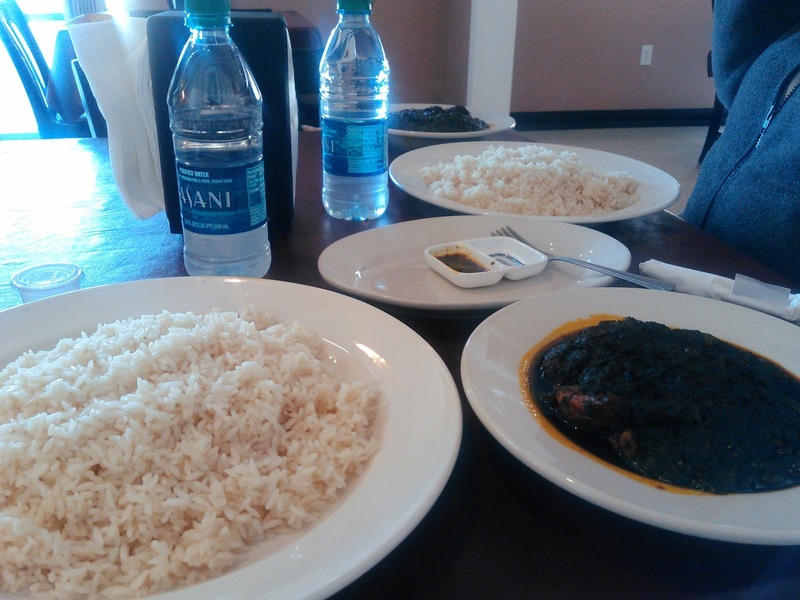 The taste did not disappoint the aromas coming from the steaming hot plates. You don't have to wonder what you are eating. The meat was fall off the bone tender and itself seasoned to perfection. 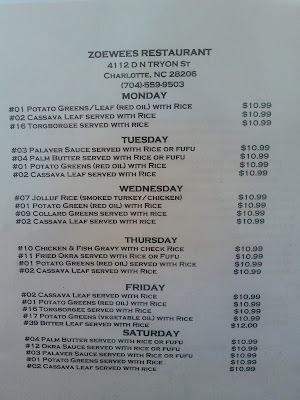 For my first foray into African food here in Charlotte, I was not disappointed. 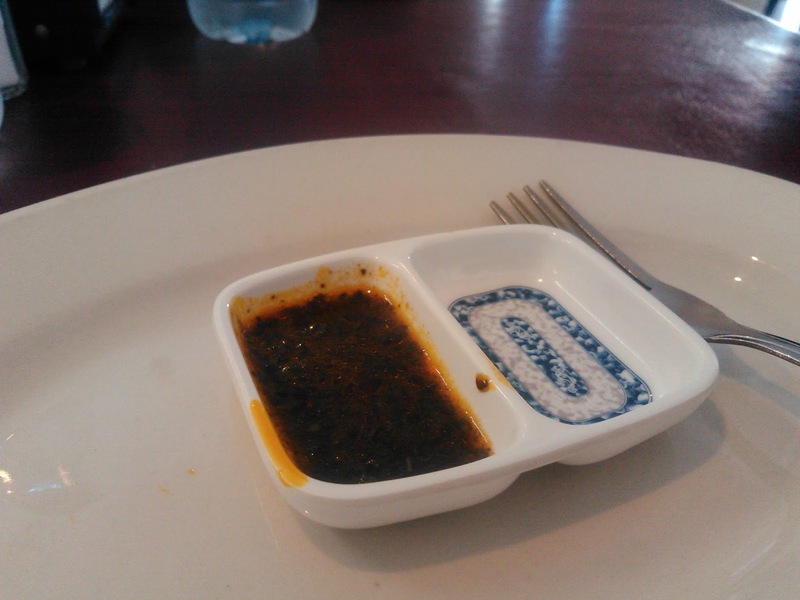 The potato leaves reminded me of spinach, with the same slight bitterness, but lovingly lost within the spicy sauce. The goal (which I accomplished! ), like most indigenous meals, is to slather this spicy concoction over the rice and eat it, sopping up the sauce along the with cassava bread. I didn't have any bread, but no matter. Even with amazingly generous portions, I ate it all. And, the prices are very reasonable. We both ate for under $30.00. There are so many other things to try here. Don't be afraid to ask questions. 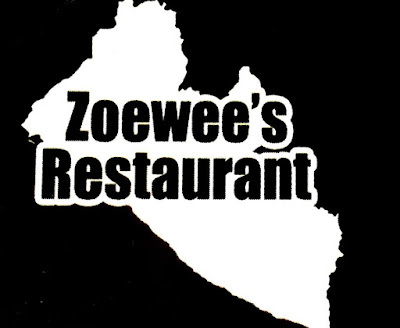 From links below from Yelp and Trip Advisor, you can see Zoewee's gets very good reviews. 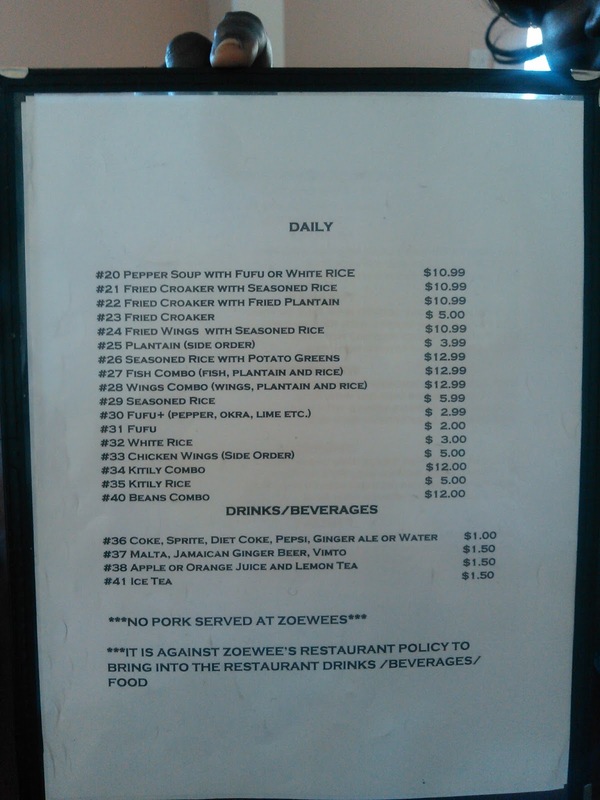 It is due to the dedication to keeping authenticity in the traditional preparation and service of their hometown dishes that Zoewee's is well respected and patronized by transplants from Liberia and your truly from New York City! 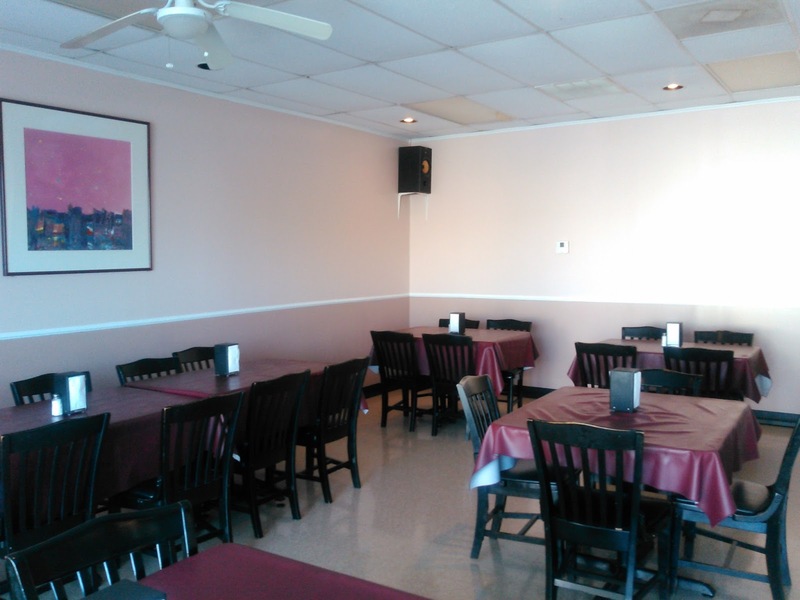 Definitely stop in, say hello and grab a seat! Ask Lewis what his name means! Front counter with dual heights. Love that touch! First and foremost, I ALWAYS recommend CA (call ahead) for your individual needs. Everyone is friendly, and I believe they will jump at the chance to please. 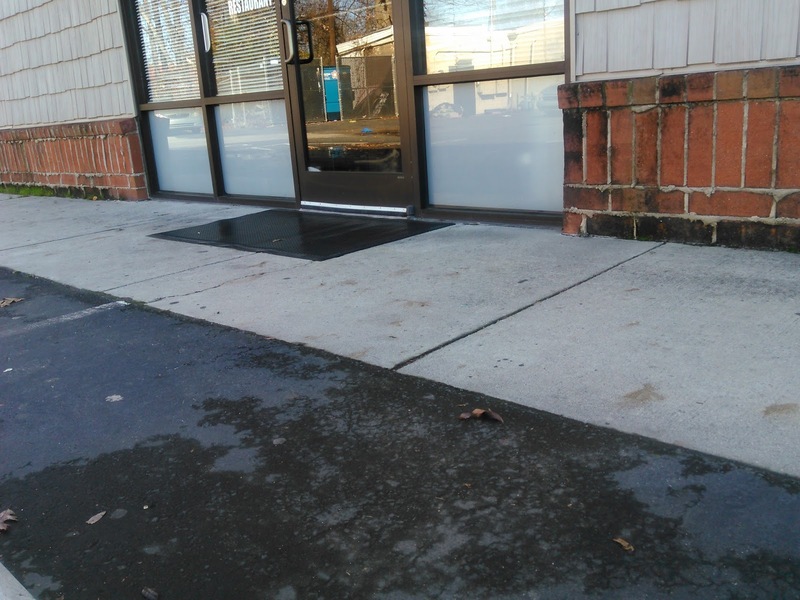 Flat concrete sidewalk in front leads to low threshold entrance. Quiet and well-lit establishment with few sensory related distractions. Nighttime may be a different experience. Staff is willing to LWAS (Listen with a Smile! Sidewalk is flush with the parking lot. Rubber mat at the front of the door. So, What is Foodie4Access CLT? So, now that you understand the original concept behind F4A, now I bet you are asking why then is there something called Foodie4AccessCLT (F4ACLT)? Foodie4AccessCLT is a nonprofit that focuses on maximizing the number of people with disabilities who attend educational, social and cultural events, as well as participate in great, accessible food destinations in Charlotte, North Carolina. F4ACLT works with local disability advocates, disability-related nonprofits or other groups to increase the number of people with disabilities, or families with a child with a disability) who get out to eat, learn and connect about town to discuss all things foodie, social, accessible and/or cultural. You don't have to have a specific disability to be a part of F4ACLT. We welcome anyone who wants to be a part of a growing group of consciously aware people who celebrate inclusion, connection, and empowerment for all people, including those who have a disability. The blog will follow along as I go to fantastic restaurants run by great chefs and their staff, who get the big picture of inclusion. We will be a part of social events around town, philanthropic efforts to raise funds for outings or donate necessities to help others, and community focused gatherings. We want to talk to those of you who want to make a difference in Charlotte; who want to see the community of people with disabilities strong, connected and involved in their community. The ultimate purpose of F4ACLT is to eat great food, support each other in our endeavors, and celebrate all of who we are on this journey of life. Hope you enjoy the ride! If you are not familiar with the F4A concept, let me tell you the story. Several years ago, I created the Foodie4Access idea, name and blog in order to talk about food and accessibility. Strange combination, right? Well, the story goes like this. Three years ago, I attended a self-advocacy training with my oldest son. He really didn't want to go, but I wanted to learn as much as I could on how to successfully advocate for him and his brother. As a parental attendant, I sat in the back, behind everyone, though I got copies of all the content of the training. I watched them go through the breakout sessions, the workshop team match-ups and the seminar lectures. but, where I saw them connect the most was over meals. Suddenly,the polite walls came down, everyone oohed and aahhed over hot, steaming dishes and sandwich combinations. There was laughter, sharing of family history and tales from other dining tables. I noticed something, but wasn't sure exactly what I was seeing. Later on in the six week training, I began to notice that while we pulled through the trainngs, we glided through meals; lingering over desserts and each other. Finally, I understood. It was connection....through food. And, just like that, an idea was formed. I could talk about accessibility in a seminar or a Powerpoint-driven presentation, or I could sit down at a meal and ask questions, hear histories and testimonies, and learn about others through the sharing of a meal. In those training meal times, I could see how if one needed an alternate menu or another one needed their food cut and arranged, or yet another one had allergies, no assumptions were made. I saw how everyone just made sure those needs were met. Because in the end, we all wanted to share the same feeling; enjoyment of a well prepared meal, regardless of what accommodations were needed to get there. I thought...what would happen if we could talk about our needs over a shared meal? If we could care for each other in that setting? Perhaps that feeling would carry over to the workplace, the marketplace, the community center, the movie theater, anywhere and everywhere people went; all people, disabled or not? What if we understood that if we could share a meal and make it accessible for all, we could do the same for the rest of the community? And, that is how Foodie4Access was born. Yes, we may talk about the accessibility of a restaurant, but first we want to find out how accessible is your mind? Your thought patterns? Your attitudes? Come, sit around the table and let's talk. Do you feel sharing food is a way to foster inclusion and a sense of community? What other ways can help foster discussions of accessibility?